Catholina Lambert, Paterson, New Jersey. Durand-Ruel Galleries, New York (acquired from the above, 16 May 1895, and until 1949). Private collection, Switzerland (by 1959); sale, Christie's, London, 28 November 1994, lot 8. Acquired at the above sale by the late owner. D. Wildenstein, Claude Monet: Biographie et catalogue raisonné, Paris, 1974, vol. I, p. 329, no. 493 (illustrated). D. Wildenstein, Monet: Catalogue raisonné, Cologne, 1996, vol. II, p. 196, no. 493 (illustrated). M. Clarke and R. Thomson, Monet: The Seine and The Sea, 1878-1883, exh. cat., National Galleries of Scotland, Edinburgh, 2003, pp. 18 and 174, note 23. New York, Durand-Ruel Galleries, Exhibition of Paintings by Claude Monet, April 1931, no. 4 (dated 1879). Paris, Galerie Durand-Ruel et Cie., Claude Monet, May-September 1959, no. 24 (dated 1879). Monet painted L'Escalier during the very first months that he spent at Vétheuil, a rural hamlet about sixty kilometers northwest of Paris where he and his family lived from August 1878 until December 1881. This was a decisive moment of personal and professional reassessment for the artist. Following his move to Vétheuil, he entirely abandoned the contemporary themes that had dominated his earlier oeuvre and began to focus instead on capturing fugitive aspects of nature, employing a nascent serial technique that laid the groundwork for much of his important later production. "The acknowledged painter of contemporary life who settled in Vétheuil in 1878 departed from that town in 1881, as from a chrysalis, renewed and redirected," Carole McNamara has written. "He was no longer the painter of modernity who 'preferred an English garden to a corner of the forest,' as Zola had described him. Monet settled farther downriver at Giverny and, through his series paintings, created a whole new understanding of landscape painting. Many of those later innovations derived their impetus from the paintings executed [at Vétheuil]" (Monet at Vétheuil: The Turning Point, exh. cat., University of Michigan Museum of Art, Ann Arbor, 1998, p. 86). At the time that Monet moved to Vétheuil, the village boasted only six hundred inhabitants, less than one-tenth the population of Argenteuil, where he had lived and worked for the previous seven years. With no rail station and only minimal industry, moreover, Vétheuil showed little evidence of modernity, a trend which was making major inroads elsewhere in the valley of the Seine. Monet found a pleasant house to rent on the southern edge of town, with a large garden that sloped directly down to the Seine (fig. 1). He was accompanied by his wife Camille, who was in failing health, and their two young sons, Jean and Michel. Joining the family was Ernest Hoschedé, a pre-eminent early collector of Impressionist painting, along with his wife Alice (whom Monet would eventually marry) and the couple's six children. Once the managing partner of a prosperous Parisian fabric firm and a major patron of Monet, Hoschedé had been forced to declare bankruptcy in 1877, losing his business, his home, and his entire art collection. Immediately upon the two families' arrival at Vétheuil, Monet set to work exploring the landscape around their new home, describing the area in a letter to Eugène Maurer as "a ravishing spot from which I should be able to extract some things that aren't bad" (quoted in exh. cat., op. cit., 2003, p. 17). Monet had numerous reasons for moving from Argenteuil to Vétheuil. He was seeking a peaceful environment for the ailing Camille, who died in September 1879. He also required a lower cost of living, his income in 1878 having plummeted to less than half of what it had been just five years earlier. Finally, the appeal of Argenteuil had diminished for Monet, as both the population and the amount of industry had exploded. Paul Tucker has explained, "By 1876, it was clear that Argenteuil's country calm and natural beauty were being renounced as the town marched forward to the beat of progress. Monet's paintings from 1876 are not in step with this cadence. His efforts are concentrated on his garden, where, among his roses and dahlias, he tries to reinstate his idyllic petite ville. He does not simply turn his back on the town, he literally walls it out. Monet had embarked on a new path, one that would eventually lead him from Argenteuil to the more rural town of Vétheuil" (Monet at Argenteuil, New Haven, 1982, p. 153). At Vétheuil, Monet's work indeed underwent a profound change. Forsaking the scenes of contemporary life and leisure that had been the mainstay of his production at Argenteuil between 1871 and 1875, Monet focused instead on the tranquil backwaters of the Seine, the orchards dotting the surrounding hills, and the quiet rural paths of the village. Although small-scale human figures are sometimes present, they are never the focus of the painting; they form part of the fabric of the landscape, rather than coming forward to engage the viewer. "Vétheuil offered Monet something that in his twenty-year career as a landscape painter he had not yet experienced, an extended opportunity to paint rural France, all but uncluttered by the intrusions of modernity," Richard Thomson has written. "In the three and a quarter years Monet inhabited Vétheuil he made some two hundred paintings, an output redolent of contentment and stability" (exh. cat., op. cit., Edinburgh, 2003, p. 17). Some thirty of these paintings date to the fall of 1878, between Monet's arrival at Vétheuil and the first frost of the season. "The ease and delight of these views, no less than their sheer number, suggest that Monet had finally found true contentment," Tucker has written, "at least when he was engaged with what he knew best--painting out of doors" (Claude Monet: Life and Art, New Haven, 1995, p. 102). Many of these early explorations from Vétheuil are open, panoramic views of the Seine, nearly three hundred meters wide at this point and studded with tree-covered islets. In other instances, by contrast, Monet set up his easel in the village of Vétheuil itself, painting picturesque, time-honored motifs such as the fourteenth-century church of Notre-Dame (fig. 2). Unusual in Monet's oeuvre in their sense of intimacy and enclosure, more characteristic of Bonnard's treatment of the landscape (fig. 3), these views of Vétheuil demonstrate the exploratory zeal that Monet felt upon settling into his new home, which encouraged him to experiment with new motifs and fresh pictorial solutions. 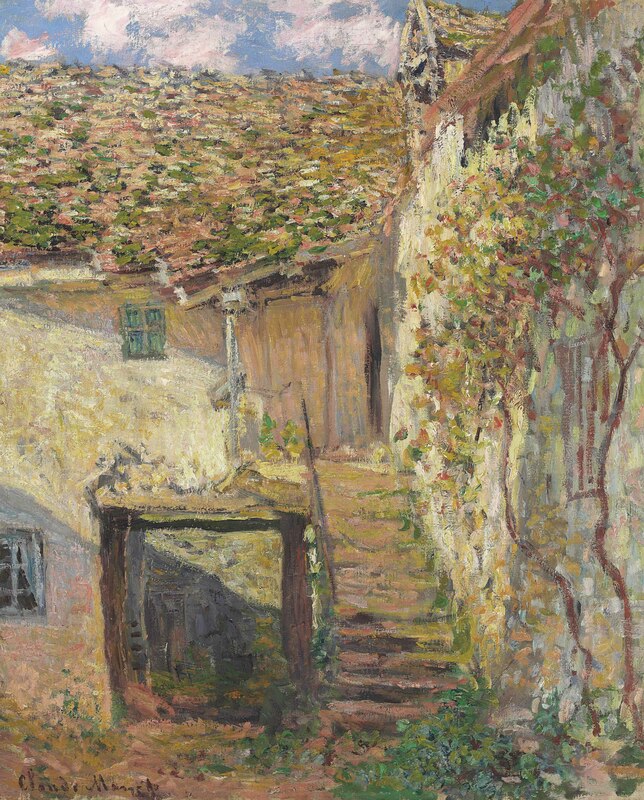 In L'Escalier, Monet has selected as his subject an unprepossessing but utterly charming corner of an old farmyard. The pale stucco walls and steeply slanting, shingled roofs form a shallow succession of jostling planes, with only a narrow strip of cloud-flecked sky visible at the top of the canvas. In compositional terms, L'Escalier is anchored around a narrow set of stairs that leads the viewer's eye into the scene, a device that Monet would reprise three years later in his celebrated views of Jean and Michel in the garden of the family's home at Vétheuil (fig. 4). The subtle but richly nuanced palette of L'Escalier is dominated by yellow, ochre, and sepia tones, which suffuse the scene in a warm, autumnal glow. Weathered buildings and fall foliage alike are painted with the same golden hues and active, flickering touch, suggesting that the work of man and that of nature--rather than being at odds, as Monet had come to find them at Argenteuil--are harmoniously and inextricably linked in this rustic, peaceful milieu. The present painting has an exceptionally important early provenance. Its first owner was Catholina Lambert, one of the most fervent collectors of Impressionist painting in the United States during the 1890s. Born and raised in Yorkshire, England, Lambert had emigrated in 1851 to Paterson, New Jersey, where he established himself as a leading manufacturer of fine silks. He began purchasing art during frequent trips to Paris in the late 1850s, and within thirty years, had amassed a collection of hundreds of paintings, ranging in date from the Renaissance to the nineteenth century. His Impressionist holdings included at least twenty-four works by Monet and eighteen by Sisley, along with several each by Renoir and Pissarro. Lambert acquired most of these through the dealer Durand-Ruel, whose pioneering exhibition of Impressionist painting at the American Art Association in New York in 1886 had marked the first large-scale introduction of Impressionism to American audiences. In 1891, Lambert built a crenellated castle called "Belle Vista" on the crest of Garrett Mountain overlooking the Paterson mills, with an opulent, three-story gallery to house his magnificent art collection. (fig. 1) Claude Monet, La porte du jardin à Vétheuil, 1881. Sold, Christie's, New York, 9 May 2007, lot 19. (fig. 2) Claude Monet, L'Eglise de Vétheuil, 1878. National Gallery of Scotland, Edinburgh. (fig. 3) Pierre Bonnard, Impasse ou La Ruelle (Le Cannet), 1925. Sold, Christie's, New York, 4 May 2010, lot 11. (fig. 4) Claude Monet, Le jardin de l'artiste à Vétheuil, 1880. National Gallery of Art, Washington, D.C.
Few individuals have contributed so greatly to contemporary Jewish life as Edgar M. Bronfman. A visionary businessman and unyielding advocate for world Jewry, Mr. Bronfman translated his tremendous success at the Seagram Company into a decades-long journey in philanthropy, dedicating himself to promoting a "Jewish renaissance" whose effects continue to be felt to this day. Edgar M. Bronfman joined his family's Canadian distillery business at just 21 years old, working as an apprentice taster and accounting clerk before quickly ascending the executive ranks. In 1957, he took over Seagram's American subsidiary, and in 1971 was placed at the head of the entire company, where he implemented a series of diversifying moves that secured Seagram's position as one of the world's most innovative firms. With the resources acquired via his business success, Mr. Bronfman devoted his energies to the cause of the Jewish people, becoming a kind of ambassador for the ways in which Judaic learning, culture, and history could enrich the lives of all peoples. "My goal," Mr. Bronfman wrote, "is to build a Jewish future by working to form a knowledgeable, proud and welcoming Jewish community throughout the world." After he was elected president of the World Jewish Congress in 1981, Edgar M. Bronfman began a series of remarkable international campaigns for the security and prosperity of the Jewish people. Under his 26-year tenure, the WJC became the world's preeminent Jewish institution, recognized by world leaders as a formidable voice in diplomatic affairs. Of particular note was Mr. Bronfman's role in advocating for Jewish rights and well-being in the Soviet Union, and in 1985 he became the first WJC president to be formally received by the Kremlin. Convinced of the need to present a strong and unified Jewish voice, Mr. Bronfman earned a reputation amongst world leaders and diplomats as a resolute, tireless negotiator. Former U.S. Secretary of State Hillary Clinton hailed him as a "champion for justice and human dignity," adding that he "exuded a confidence and honesty that won him the friendship and support of presidents and popes and people everywhere." In 1982, Mr. Bronfman became the first representative of a Jewish organization to speak before the United Nations, and in the 1990s he spearheaded the WJC's campaign to recover Jewish property seized during the upheavals and aftermath of the Second World War. Mr. Bronfman continually expanded his efforts, serving as president of the World Jewish Restitution Organization and chairman of the United States Commission on Holocaust Era Assets. Behind Edgar M. Bronfman's international advocacy in the World Jewish Congress was his belief in Jewish culture, heritage, and values. He forever cherished the traditions at the heart of Judaism: learning, pluralism, debate, and enquiry--the essential components for the faith's continued relevance. As founder, president, and chairman of the Samuel Bronfman Foundation--named in honor of his father, a Canadian businessman and philanthropist--Mr. Bronfman focused on international engagement, bringing Jewish knowledge to people of all backgrounds. Mr. Bronfman was justly proud of his outreach to young Jews, particularly via Hillel: The Foundation for Jewish Campus Life, and the Bronfman Youth Fellowships. He revived Hillel in the 1990s, transforming it into the largest Jewish campus organization in the world, with chapters reaching beyond the United States to Russia, Eastern Europe, Israel, and South America. He founded the prestigious Bronfman Youth Fellowship program in 1987, challenging future Jewish thinkers, writers, and leaders from Israel and North America to deepen their understanding of Judaism and the importance of social responsibility. As his own life was enriched with serious intellectual study and hard work, so were the lives of young people enriched by Edgar M. Bronfman's tremendous generosity. Under Mr. Bronfman's leadership, the Samuel Bronfman Foundation provided support to organizations including the 92nd Street Y; the American Jewish World Service; Birthright Israel; the Bronfman Center at New York University, and the UJA. As the potential for philanthropic outreach expanded in the digital age, the Foundation oversaw initiatives such as MyJewishLearning.com and Kveller, a website focused on Jewish parenting. In 2012, Edgar M. Bronfman joined the world's greatest philanthropic leaders in signing the Giving Pledge. "By enabling people to do good work," he wrote upon signing the Pledge, "I participate in a brighter future for the Jewish people and, I hope, all of humanity." Edgar M. Bronfman was the author of Hope, Not Fear, The Third Act, The Making of a Jew, Good Spirits, and the Bronfman Haggadah, illustrated by his wife, Jan Aronson. Internationally recognized for his prodigious giving and dedication, Mr. Bronfman was inducted into the French Legion of Honor; was awarded the Presidential Medal of Freedom by Bill Clinton, the Leo Baeck Medal, the Hillel Renaissance Award, and the Justice Louis D. Brandeis Award; and was bestowed honorary degrees from the University of Rochester, New York University, the Hebrew University of Jerusalem, Tulane University, Williams College, and Pace University. Michael Steinhardt of the Hillel Foundation called Mr. Bronfman "the great Jew of his era," while Dana Raucher, executive director of the Samuel Bronfman foundation, noted that "Edgar showed how vision and long-term thinking can impact the entire landscape of Jewish life." In his absolute devotion to humanitarianism and the Judaic traditions that informed his life, Edgar M. Bronfman stands as an inspirational figure for people of all backgrounds--a testament to the power of belief in the modern world.